A common situation that you my encounter as an InMotion Hosting customer is selecting the appropriate account(s) when you have multiple subscriptions that may or may not be accessible to a WebPro. How is this handled within the WebPro interface? InMotion Hosting provides an easy to use solution for clients who provide access to a WebPro using the interface within the Account Management Panel (AMP). Follow the steps below to learn how to edit WebPro access with the interface provided within AMP. Note that the following instructions apply to InMotion Hosting accounts that have integrated WebPro access. Once you're logged in, click on the WebPro icon if necessary. 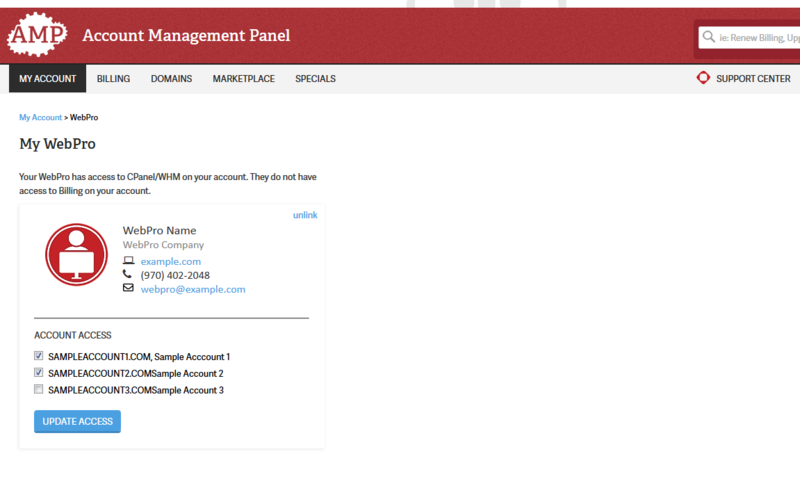 When you're in the WebPro dashboard you will see the WebPro contact card and the accounts that are linked to the WebPro. Beside each of your subscribed accounts you will see a checkbox. If the box is checked, then the WebPro will have access to that account. Click on the box to link an account, or click on a checked box to unlink an account. Click on the blue button labeled Update Access in order to save your changes. That completes our tutorial on editing WebPro from a client's WebPro interface. To learn more about the WebPro interface, please see our Product Guide for the WebPro.